Temperatures: up to 600 deg C.
Our TD Series Dryer (Flash Dryer Bagasse Dryer) is made for suspension drying of powdery and granular material such as sawdust, bagasse pith and press mud etc. having maximum moisture content of 35% (wet basis). Owing to our consistency in quality we are proclaimed as pioneers for the manufacture of high performance Dryer. In order to meet the changing demands of varied clients, we are offering tubular bundle dryers. 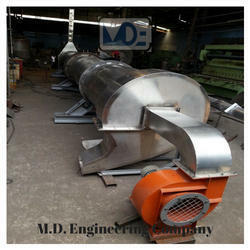 These dryers are mainly used for bulk drying of agro products like sugar cane bagasse, rice west and wood chips. These dryers are available in capacities of 2000 lit. /hr. Of water evaporation. Hot air draft blower having range upto 400 degrees. All cableing and VFD operated motors included. Brand New Unused Rotary bagasse dryer available for sale. Manufactured using heavy duty materail. The bagasse which comes out of mills contains about 50% moisture. This bagasse is used as a fuel in boilers to generate steam. Feature: So comfortable to running jaggery units 12months at also in rainy season. Overall sizes are as per Model like SBD-1,2,3. : Weght also as per Models. Bagasse and its conservation has become a necessity for up coming sugar factories moving towards co-generation. Enviropol- Flash Dryers for Bagasse maximizes the generation of heat energy from the available system through substantial reduction in moisture content.